Gecko has lately received a lot of negative publicity as a result of criticism by the Minister for State Development, Anna Bligh, claiming we were running a scare campaign by publishing a digitally created picture of what the Spit might look like if the cruise terminal goes ahead. However, the picture and commentary has also produced a lot of support including some much-needed donations. The picture was created from images of Fort Lauderdale, a large cruise liner port in Florida, and at the time it was created we had no information from the government about what was planned for the Spit; only a statement that it would take the big ships which can?t fit under the Gateway Bridge to enter Brisbane. The ship depicted was over 300 metres, but again we had no information of what size ship would be used in the Seaway. The Bulletin, by contrast, had a liner sailing into the Broadwater with no terminal or infrastructure at all (refer Photo Gallery - General), just a forested Spit. The Bulletin also stated on September 15th that ships of 180 metres would be used in the Seaway. However, the government simulation study clearly states that the smallest of the ships tested, the Arcadia at 245m, could not safely navigate the Seaway in winds over 16 knots and an ebb tide of 1.3 knots. The larger ships tested, the Superstar Leo at 268m, and the Golden Princess at 289m, can apparently negotiate a dredged Seaway in winds up to 20 knots. Many people have written to the Bulletin pointing out these facts, but none have been published. An ebb tide of 1.3 knots may be unrealistic rendering these simulation studies inaccurate. 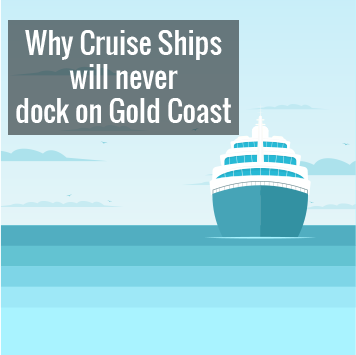 Many surfers and boaties familiar with the Seaway consider this figure an underestimate. The picture here is another digitally enhanced photo that could reflect what the Spit looks like in years to come if the Beattie government proposed terminal goes ahead. 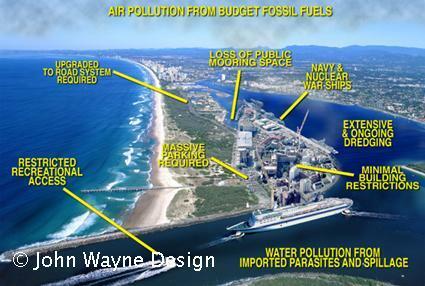 When you consider how may 'developments' have been approved on the Gold Coast amidst public outcry and allegations of councellors and developers coruption and the lack of infrastructure to cope with them, the future of the Spit could be bleak. Labrador residents may be in for a change of view and smell in the Broadwater.